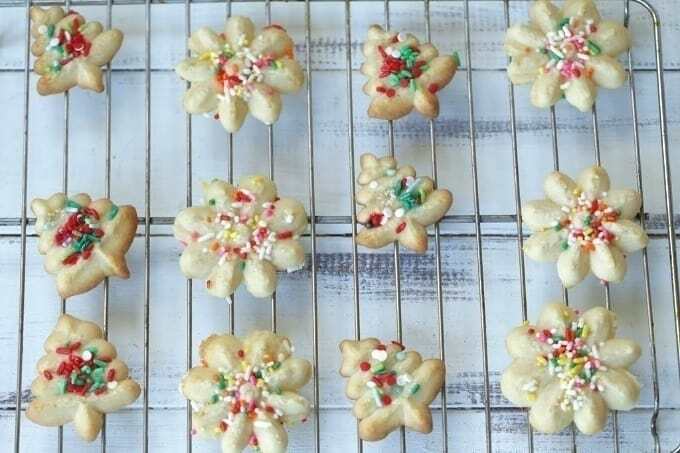 These classic Spritz Cookies are rich, buttery and a must-have cookie for Christmas. Rumor has it that they are Santa’s favorite too. It’s not Christmas in our house without a batch or two of Classic Spritz Cookies. These rich and buttery cookies are my absolute favorite! So much so that I have to wait to make this recipe until the last possible day so I don’t eat them all. 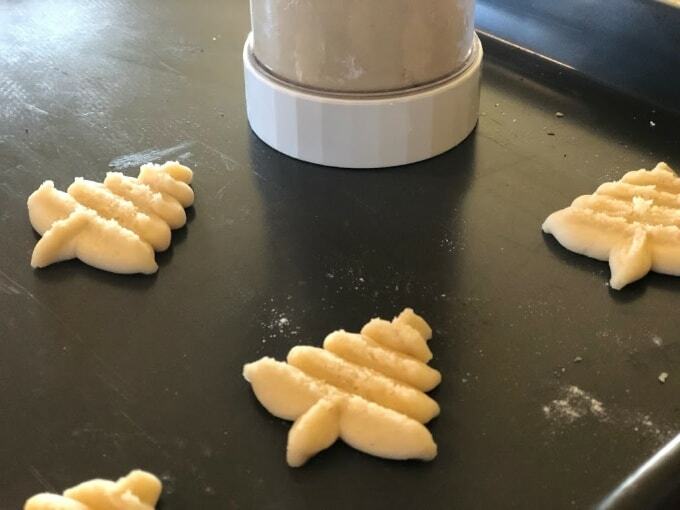 This classic recipe is pretty easy to make but you will need a cookie press to make the fancy shapes you see here. I think the press that I have has about 12 different shapes ranging from flowers to wreaths. These traditional German cookies aren’t just for Christmas. They are perfect for any time of the year because you can press out seasonal shapes in no time. I remember so well making these gems with my mom. In fact, I think she still has her original copper cookie press which would probably be considered an antique now. The recipe is super simple too. The usual stars like butter, flour, eggs and sugar make an award-winning performance. They are buttery perfection. ALWAYS use an ungreased aluminum baking sheet to press them out on. You can add red or green food coloring to the dough to make them more festive. These don’t work as well if your kitchen is hot. It makes the dough too sticky and difficult to work with. The cookies are tender so don’t remove them from the cookie sheet until they have cooled, or else they may break. You can add different flavorings to the dough. 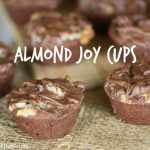 Almond flavoring is another favorite of mine. Decorate the Spritz Cookies with sprinkles , nuts, candies or sanding sugar before you bake them if you wish. You can also decorate them with Royal Icing or gel icing once they have cooled. Store your Spritz Cookies in a food storage container for one week if unfrozen or up to three months frozen. 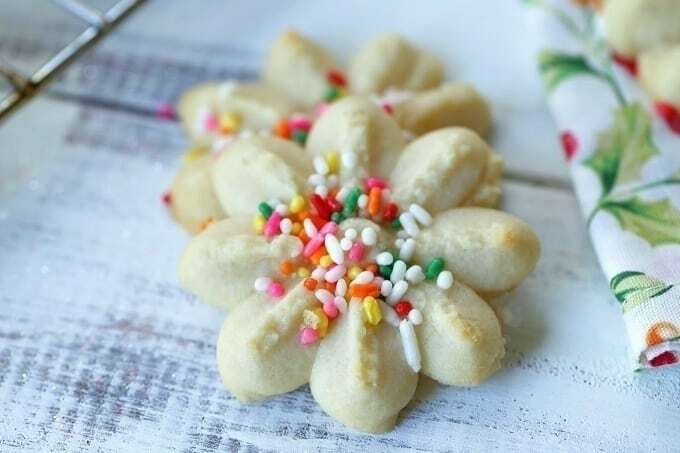 These classic Spritz Cookies are rich, buttery and a must-have cookie for Christmas. Rumor has it that they are Santa's favorite too. Sift the flour, baking soda, and salt together. Set aside. Use an electric mixer to beat the butter until smooth. Add the sugar and mix until light and fluffy, about 3 minutes. Reduce mixer speed to low then add in the egg, followed by the milk, vanilla. Fill cookie press with dough. Press each cookie onto an aluminum baking sheet (not parchment paper and NOT non-stick). Add sprinkles before baking. Bake cookies for 10 to 12 minutes, or when the edges just barely begin to brown. Cool 5 minutes and remove the cookies from the baking sheet. Cookies in a Jar – A Perfect Gift Idea!